The US is marshalling its key forces in the offensive against the population of eastern and southern Ukraine. On the ground, the Kiev-controlled armed forces have been reconstituted so that shock troop are supplemented by fighters from the far-right Right Sector. Their aim is to crush any opposition to the pro-Western government installed by coup in Kiev. The symbolically important town of Slaviansk has been devastated by bombardment and the population reduced by three-quarters. Slaviansk had been the cradle of the anti-Kiev, anti-imperialist forces. 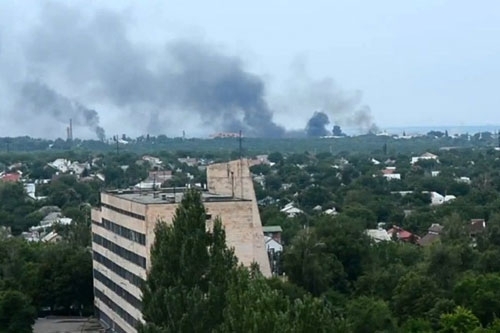 Lugansk, a city of half a million is now under aerial bombardment. Widespread reports suggest huge dislocation of refugees to Russia. Donetsk, home to a million people is facing a brutal siege. The US is hamstrung by domestic opposition against any direct military intervention of its own and the Kiev government does not have the resources to fund a large scale offensive. Instead, US imperialism has been able to finance the assault through the IMF. It was made abundantly clear at the IMF press briefing announcing $17bn in loans to Ukraine that some portion of the funds could and would be used to fund military operations. Marshalling its array of forces, US imperialism aims to ensure further NATO encroachment on to Russia’s borders and the curbing of Russia’s ability to resist US interests, however feeble or half-hearted. To this has been added the urgent task of crushing the popular uprisings and the formation of ‘people’s republics’ in eastern Ukraine. The CIA, the US State Department, NATO and the IMF are not benign organisations. Unfortunately, this needs saying because of the desperate confusion of so many forces on the left in the imperialist countries such as Britain. It is ABC for socialists to oppose their own imperialism, or ought to be. In fact there is only one imperialist power operating in Ukraine and that is the US and its NATO/IMF allies.